Studio Line: MGM - Today The Pond…Tomorrow The World! "A shocker reminiscent of Alfred Hitchcock's The Birds" (Variety), this amphibious horror flick teeming with thousands of nasty-tempered creatures that are hopping mad -- and murderous. Jumping with action, suspense revenge and Southern Gothic charm, Frogs' stars Ray Milland, Sam Elliott and Joan Van Ark are constantly a lily away from croaking! Joan Crockett (Milland) is an aging, physically disable millionaire who invites this family to his island estate for his birthday party. The old man is more than crotchety…he's crazy! Hating nature, Crockett poisons anything that crawls on his property. But on the night of his shindig, it's nature's payback time, as thousands of frogs whip up every bug and slimy thing into a toxic frenzy until the entire environment goes environ-mental. DVD: Widescreen 1.85:1/16x9, standard 1.33:1; audio English Digital Mono, Spanish Digital Mono; subtitles Spanish, French; closed-captioned; double sided - single layered; 24 chapters; rated PG; 90 min. ; $19.98; street date 9/19/00. Did Congress pass a law in the Seventies that required every movie made to have some sort of "message"? I think this must have occurred, since so many of these films cram their "socially-relevant" takes down our throats. This even infected grade-B horror flicks, as I discovered while I watched Frogs, a schlock thriller from 1972. The film focuses on a rich Southern family about to celebrate some birthdays and the Fourth of July and photographer Pickett Smith (Sam Elliott) who notices not all is well in the swamplands around the family's compound as he completes an environmentally-themed layout. It seems that there sure are a lot of frogs hopping around this year, and they're getting awfully annoying. Eventually a variety of reptiles and other creepy-crawlies start to exact revenge on mankind for pollution and other contaminants. Who'll survive the onslaught? Who cares? Not me, though I found this cheesy and campy attempt to remake Hitchcock's The Birds with a slimier cast of critters to offer some moderately enjoyable bits at times. Actually, I found some of Frogs to be unsettling, but that's largely due to my dislike of nature; just show me a tree and I break into hives! The close encounters humans have with disgusting wildlife gave me the creeps. Eliminate that factor and you have little more than a pretty lousy B-movie. Ray Milland offers a nicely crotchety performance as patriarch Jason Crockett, but he's the lone beacon of talent in this wasteland of hacks. Actually, the poor quality of the remaining actors may have been a positive, because it made it much more fun to watch them get assaulted by the critters. One clever - though illogical - part of Frogs stems from these attacks. Each one is performed by a different species, and I actually found it moderately entertaining to see in what manner the next victim would depart this world. Other than that small sliver of fun, Frogs is generally a dud. The movie seems dated, silly and without much merit. However, those who seek out campy films will probably like it. 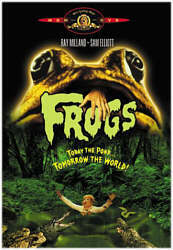 Frogs appears in both its original theatrical aspect ratio of approximately 1.85:1 and in a fullscreen edition on this double-sided, single-layered DVD; the letterboxed image has been enhanced for 16X9 televisions. Only the widescreen side was rated for this review. How in the world does a movie this old, this obscure and this cheap look this good? It's a mystery, but Frogs presented a simply fantastic picture. Sharpness seemed very crisp and detailed throughout the film, with virtually no soft or hazy spots; at all times the image was clear and accurate. Moiré effects and jagged edges caused no concerns, and I noticed almost no artifacts from the anamorphic downconversion on my 4X3 TV. Print flaws seemed nearly as minimal. I witnessed a few speckles, a smidgen of grit, and a nick or two, but that was it; I couldn't detect any grain or more significant defects such as scratches, tears, hairs, dirt or marks. Colors appeared nicely natural and accurate. The hues seemed clean and bright but displayed no problems like bleeding or noise. Black levels were appropriately deep and dense with solid contrast, and shadow detail was acceptably opaque but it lacked any excessive heaviness. Much of the reason Frogs looked so good stemmed from the abundance of shots done in natural light; daytime usually makes movies look better. However, this film seemed crisp and clear even during interiors with heavy shadows; the contrast worked well and the image always appeared very attractive. I came exceedingly close to awarding an "A-" to this picture but backed off because of print flaws; they remained fairly minor but were too prevalent for an "A" level grade. Nonetheless, rest assured that Frogs presents a fine image. Much less exciting is the quality of the film's monaural soundtrack. Dialogue seemed clear and intelligible but also was thin and flat. Effects were similarly bland and dull; they sounded acceptably recognizable but lacked any form of spark or crispness. The movie's score from Les Baxter is a synthesized affair that is really very unmusical; it spits out burps and whooshes but almost no real music. It displayed quality along the lines of the other elements: drab but serviceable. For a film from 1972, it seemed fairly average, so it got a "C". Even less positive are the DVD's supplements. We find the movie's original theatrical trailer and that's about it. The standard MGM "collectible booklet" fails to make the cut; instead we find three "Fun Facts!" on the back of the case. Well, I suppose that an obscurity like Frogs is lucky to get any form of DVD release, much less one with substantial extras. The movie is mildly entertaining in a strange way; I can't say I really enjoyed it, but I found it modestly fun in a goofy manner. The DVD offers a shockingly strong picture plus average for the era sound and virtually no extras. If campy Seventies horror is your bag, Frogs may merit a look.